More users prefer to watch movies, video clips and music videos instead of listening to the audio. However, the important role of audio will never be replaced. This can be easily proved by yourself, for example, you want to extract background audio from an amazing video, or only need the audio part of a video file for use. When you really confront such a situation, I think you’d better use an audio extractor to extract sound from video. When you are searching “audio extractor” on the browser, it’s easy to get a lot of information like that. That’s the question, how do you choose the best one from the numerous suggestions? So you had better know some tricks, like giving priority to free audio extractor. Therefore, I’m going to list three free tools to extract audio from a video. 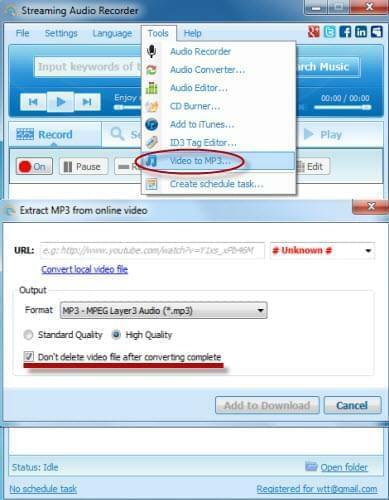 MP3 Grabber is an online application designed for extracting audio from video free. That is, you can extract sound from videos located on your computer’s hard disc, and save them into common audio formats, which includes MP3, WMA, WAV, OGG, AAC, RA and FLAC. As long as you choose the compatible output format, you may transfer the extracted audio files to your portable devices, like CD, MP3 Player, iPod, Android phone or other else. Just a few steps, and then you can extract audio from video free without any efforts. In addition, it supports to extract audio from online videos, from which YouTube, Metacafe, Dailymotion and many more. 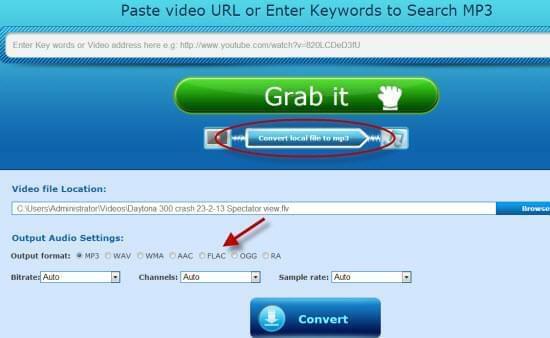 To extract audio from YouTube video, you just need copy a YouTube video address link, paste it into the search bar, and follow the prompts step by step. The same to other videos, but don’t infringe the video protected by copyright, unless you get the permission of the video’s owner. As its name implies, Apowersoft Free Online Video Converter is a free web-based service to extract sound from video online. This audio extractor is mainly applied for users who have downloaded the video on their computer’s hard disc, but only want to grab audio off the video. Intuitive interface and step guidance will help users master Apowersoft Free Online Audio Converter immediately. Actually, what makes Apowersoft Free Online Audio Converter stunning is that it offers more specific options to output audio settings. The output format contains MP3, WAV, WMA, AAC, FLAC, OGG and RA, and the audio settings contain bitrate, channels and sample rate. So you can get control of the extracted audio file. Streaming Audio Recorder is a professional program to extract audio from video. Using it, you can extract audio from any videos, like live streaming video, online movies, TV shows and other video files. This is for the reason that Streaming Audio Recorder is a combination of audio recorder and audio converter. Audio recorder helps you extract audio from live or online videos, while audio converter helps you extract audio from local video files. Well, Streaming Audio Recorder is more than just extracting audio from video, it also provides audio editor, CD burner, ID3 tag editor and a variety of radios, and enables you to add audio to iTunes and create schedule tasks. It sounds good for users who like homemade audio.